One of the most remarkable regions of Bhutan is the Trongsa region that includes the massive Trongsa Dzong. Surrounded by spectacular mountains rising thousands of feet from the valley floor, the place feels ancient and , in some ways, untouched by human settlement. As you look across the valley you can see mountains that have, literally, not faced human habitation or settlement. The word in town and among the people is that these mountains have NEVER been trod by humans. Looking at the thick undergrowth and brush, it’s easy to imagine an almost primeval place traveled only by animals. 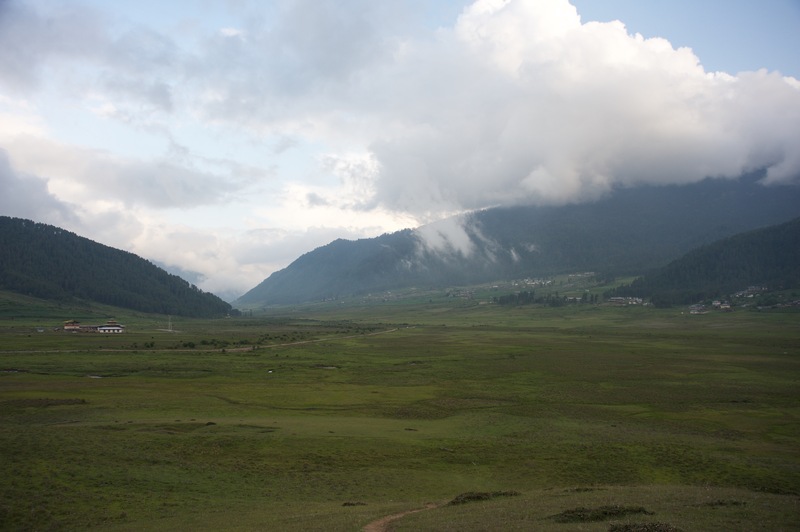 Here is a short video of the valley taken from the Yangkill Resort….enjoy! On the trail from Chele La. It has been a bit more than five years since my first excursion to Bhutan. The magical quality of this country still surprises me. For those who have traveled to Bhutan, I imagine you understand the feeling of awe and the power of this place. I will never forget the feeling of walking down the steps off the plane, stepping on the ground and truly feeling something and some place different from the rest of the world. Many people have asked “what’s so special about Bhutan?” From my perspective, the difference is in the stillness of the place and the people. Every person I have ever talked to in Bhutan has that sense of stillness. Even the students in school have that sense of quiet. It’s almost as if a still mind is built into the country in some way. Some of this stillness is the separation from many aspects of the modern world. When I say modern, I mean the buzz that is constant in cities and towns in the United States. Maybe it’s the hum of the television sets or the whir of the streets lights or the sound of cars careening down the road. Of course, this is not to say that Bhutan has escaped the modern world; that word is fast overtaking the country as satellite television, cell phones, cars, trucks, SUVs, material goods, all make their way into Bhutanese culture. So far, it seems that those “things” have not invaded to such a point that they have become the meaning of people’s lives. That working for a new car has become the be all end all of someone’s life….I do think such a situation is making it’s way into the country. My hope is Bhutanese families and individuals can see the limitations of that way of life and means of accomplishment. Time well certainly tell. These trips also are joyful because of the students and families that travel with me. Their reactions and engagement with the place is important to me. For the most part, I provide some information about Bhutan, but, for the most part, I leave the learning to the students when we arrive. I believe that experiential learning, especially when visiting countries, places, and people not familiar to us, creates a unique learning environment for both the students on the trip and for the people they encounter. Their reactions to eating ferns or learning about the Divine Madman and seeing his temple, or talking to a monk, or playing games with school children impact them much more than anything I can teach or tell. That’s it for my reflections at this point. Stay close for student reflections about the trip coming soon (as soon as they write them! ).